Cannabis horticulture includes many variables and processes. In addition to deciding which strains to grow, decisions must be made about grow-room design and the best lighting. Then there are a variety of soils, soil amendments, and pots to evaluate and choose—not to mention air circulation and ventilation needs to address, as well as other variables, like whether or not to supplement the grow with CO2. One basic thing that sometimes gets overlooked, however, is water quality. Good water management is one of the most essential considerations for any successful garden. This is particularly true for hydroponic growing, but regardless of whether cannabis is grown hydroponically or in soil, knowing water quality and addressing any pH or EC levels that are off is critical to plant health and vigor. For the purposes of this article, we will focus on the relevance of PPM for soil grows. Proper plant irrigation and feeding are two separate things, but the two are related in many ways. When growing hydroponically, nutrients are dissolved directly into the water source, which then directly feeds the plant roots. For soil grows, nutrients often are dissolved in water, which are then absorbed into the soil to reach the root system. For both methods of cultivation, starting out with healthy water—as well as nutrients in the correct ratios—is critical. Before beginning any grow operation, testing and evaluating the water is vital so that any needs or deficiencies can be identified and addressed. When people discuss water quality, a variety of terms are tossed about, which can be confusing. Let’s define the terminology used to define water quality, including the electrical conductivity (EC) as well as the parts per million (PPM) of the water These two terms often are used in the same breath because they are closely related and essentially evaluate the same thing. The PPM of water measures the amount of minerals in water, which can vary widely depending on the water source. A water PPM reading of 200 indicates that there are 200 milligrams of minerals per liter of water. Since cannabis can only absorb a limited amount of nutrients each day, adjusting the water PPM can optimize nutrient uptake, providing ideal nutrient levels to the plants. If PPM levels are too high, a cultivator risks overloading the garden with too many nutrients too fast, and nutrient overdosing, resulting in burning the plants, which is typically indicated through brown leaf tips and discolored leaves as opposed to the vibrant green of a healthy cannabis plant. Another term that’s commonly used with PPM is TDS, or the total dissolved solids in a water sample. The nutritional needs of marijuana vary throughout its life. Very young seedlings or clones will appreciate receiving water with a PPM reading of 500-600 PPM. As the plant continues to grow during the vegetative phase of its life, it will benefit from water with a higher PPM reading of 800-900. Once the cultivator reduces the photoperiod to induce flowering, the plants will do their best at 1000-1100 PPM. 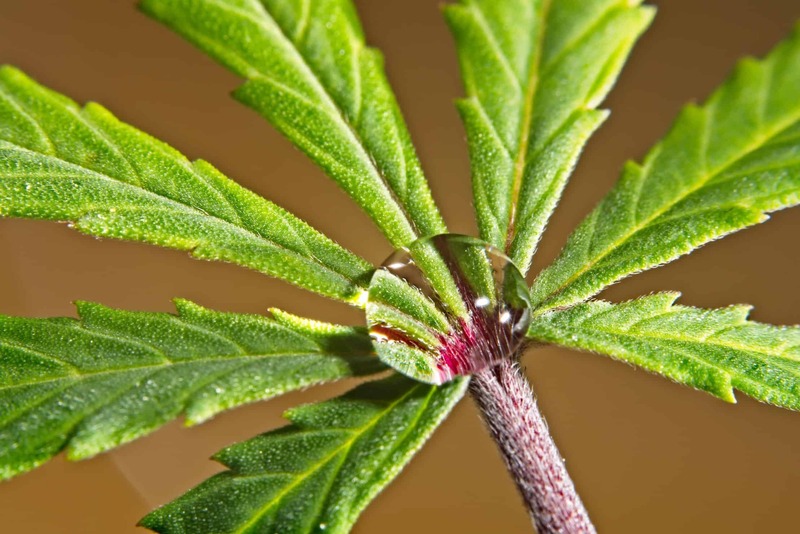 To ensure that a crop of cannabis plants receives the optimum nutrient level, the astute grower will measure his or her water PPM before adding any soil amendments to it. To determine the quality of your water source, there are meters that read the PPM concentration in the water. A parts per million meter is also referred to as a total dissolved solids (TDS) meter, and the two terms are interchangeable. There are a wide variety of PPM meters and probes on the market, and they are usually simple to use. Some are higher tech than others, and the price range varies, but you should be able to find one to suit your needs at a modest price. After calibrating the meter, you want it to read zero. Distilled water has minerals and impurities removed, so it should have a PPM reading of 0 to 5. Since tap water ranges widely. If you use water filters in your home, you can expect the PPM to be lower than unfiltered water. Water quality can range due to a number of factors like the age and material used for the pipes. While filtered water may be completely free of minerals, most city tap water will range from about 50 to 350 PPM. If your home has old pipes, however, the mineral level could be much higher, in the 500 to 700 range, and at these levels, problems can occur. In the event that your water receives an unacceptable reading of 500 or higher, you will want to address the problem, because the high PPM will compete with the soil amendments you add to the water and want your plants to absorb. The high PPM will compete with the beneficial nutrients and lock some of them out so that your plants do not receive the optimum amount. There are a few ways you can address this problem. One is to purchase some nutrients designed for hard-water use and that will work to adjust the water to an optimum PPM level. Simply following the dosage recommendation from the nutrient manufacturer should be all that’s necessary. Many of the soil additives created and marketed for use with cannabis will automatically treat water. If in doubt, ask someone at your local nursery or grow center for advice. Another option to lower your water TDS is to address the high PPM with a carbon water filter or reverse osmosis system. Using one of these will dramatically lower your water TDS levels. The EC of a water source measures the water’s salinity. Pure distilled water does not effectively conduct electricity because the carbon has been removed (remember, tap water, on the other hand, usually has a variety of impurities and additives that result in the presence of ions with positive and negative electrical charges). Home cultivators who grow in soil typically add soil additives to their water, and because these agricultural products contain salts, they add more charged ions to the water and increase its EC level—just as they increase the TDS and PPM readings. Water EC and PPM, although very similar, are different. Think of it this way: Water EC directly measures a water’s salinity level, while water PPM measures the overall mineral content, regardless of exactly which minerals may be in the water. For most water, sodium chloride is the most prominent element measured, with other minerals playing a much smaller role. For this reason, water EC and PPM are almost considered synonymous with discussing overall purity of a water source. If you are extremely curious about your water purity, the water authority of your city will most likely conduct a mineral analysis of your water if you submit a sample, but for the purposes of growing cannabis, this is not necessary. With a good PPM and TDS meter, you should have no problems with your water’s EC and PPM levels. Organic fertilizers and soils have microorganisms that also provide some level of protection against water levels that are off. Although water EC and PPM levels sound like a complex topic—and to a certain extent they are—a simple meter, using the best soil additives, and addressing your tap water with a filter if you wish, is all that you will need to do to provide healthy water to your cannabis grow. With proper water and sound cultivation practices, there’s no reason you shouldn’t harvest a sweet batch of high-quality flower in a relatively short amount of time.